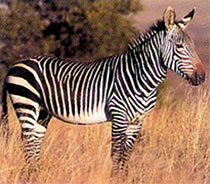 The mountain zebra is found in mountainous regions of southwestern Africa. Its coat is characterized by its startling coloration patterns, beautiful patterns of narrow vertical stripes covering its head and body. It averages around 7 to 8.5 feet in length and weighs from 550 to 800 lb. It has long ears and a dewlap below its chin, and strong hooves for climbing in mountainous terrain. Its belly is white with one black stripe. Mountain zebras eat mostly grass, bark, leaves and tree and shrub shoots. Though they prefer mountainous regions for their habitat, they are known to move to lower elevations to graze in cold weather and seek shelter in caves or wooded areas. 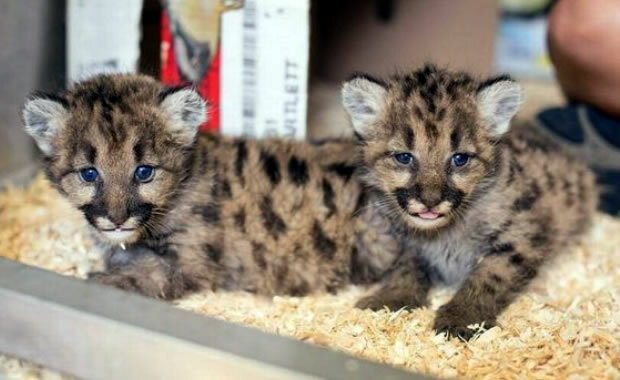 They form breeding groups that are permanent which consist of one male and up to five females. The male could control the group for years until he is defeated by a younger male in combat. Mountain zebras breed year-round. The gestation period is one year. The female produces a single foal that remains with the mother for up to three years. The mountain zebra has two subspecies: Equus zebra zebra, the Cape mountain zebra, and Equus zebra hartmannae, Hartmanns mountain zebra. The Cape mountain zebra occurs in the mountainous regions of Cape Province, South Africa, and the Hartmanns zebra occurs in extreme southwestern Angola and western Namibia. The estimated population for the Cape mountain zebra is around 600 and for the Hartmanns mountain zebra, the estimated population is believed to be around 7000. Hunting and competition with domestic livestock is the main cause of the zebras population decline. Also, droughts have also been a threat to the species. In an effort to save this species, a species management and monitoring plan has been developed to manage the zebra population in many protected areas. Copyright Notice: This article is licensed under the GNU Free Documentation License. It uses material from the Wikipedia article "Mountain zebra". Glenn, C. R. 2006. "Earth's Endangered Creatures - Mountain Zebra Facts" (Online). Accessed 4/23/2019 at http://earthsendangered.com/profile.asp?sp=517&ID=1. Need more Mountain Zebra facts?